Kenzie Williams feels like she has it all; wealth, friends, popularity and talent. But when her father tells her that he has declared bankruptcy, her whole world in New York City turns upside down. Her parents' solution while they sort through their financial and marital problems is to send Kenzie to live with her relatives in Paris . . . Idaho! Feeling like she's been sentenced to three months in Hickville Prison, Kenzie arrives in Idaho feeling like a square peg, with name brand clothes, in a round, horribly podunk, hole. Leaving everything she loves behind, Kenzie is forced to get up at the crack of dawn, do chores, and hang out with her cousin's loser friends. She feels like she's about to die until she meets Adam White, the town outcast, whose been accused of killing his best friend and is being blamed for some trouble that's been happening around town. Not only is Adam the best-looking guy she's ever seen, but he's also the most fascinating guy she's ever met and Kenzie is determined to get to know him and find out his secret. 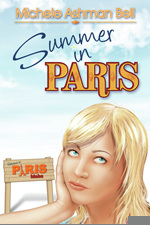 But, the longer she stays in Paris, the more she realizes, Adam isn't the only one keeping secrets.